Sally* was referred to TEACHaR for assistance in returning to school after a twelve-month absence. She had been struggling with school attendance due to mental health challenges, self-harm, behavioural issues, and difficulty with peer relationships. Sally had also recently relocated to Melbourne from a rural setting and was having trouble adjusting. She was left feeling socially isolated with little confidence. The complexity of her challenges meant that it was several months before enrollment could be attempted. Throughout this time our TEACHaR program stepped in to provide six hours of one to one teaching each week, with consultation from the care team, who investigated potential schools for Sally. The TEACHaR educator established excellent rapport with Sally by engaging her in a variety of learning tasks and helping her build confidence to enable her to return to school. Before long a school was identified and the TEACHaR educator took Sally on several tours and a pre-enrolment interview. Sally was drawn to the re-engagement program the school offered, which catered for students at all levels and provided a staged return to school. 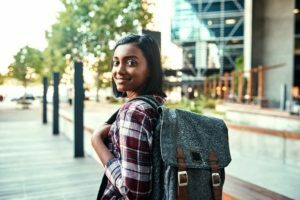 Her anxiety about returning to school was eased by the ability to slowly re-engage with the option of increasing her time when she was ready and also having the TEACHaR educator available to attend school with her if she wanted extra support. With some support, and Sally’s ability in an interview to connect honestly and openly with staff, she was finally able to enrol again in school. Together with her TEACHaR educator, the Department of Education and the Student Well being and Engagement Officer, she was able to make the necessary changes to stay within the school system. *Names and images have been changed.